This Insta-Favourite Beauty Brand Is All Set To Launch Fabulous New Lippies! The new lipsticks come with a creamy, easy to apply formula that doesn't dry out your lips. It's creamy, comfortable to wear and intensely pigmented. It has the formula of a liquid lipstick and the effect of a matte-lip gloss. Therefore the name, Demi Mattes! The ultra-luxurious formula is the perfect blend of matte and glossy. Huda has always used the power of makeup as a tool of self-expression. So every new launch from the maven is nothing short of absolutely life changing! The new line has 15 shades of mauves, nudes and pinks that look beautiful on all skin tones. Since you shouldn't expect anything but the best from the boss babe, the new collection is badass! With shade names like boy collector, lady boss, day slayer and shero, I know I can't wait for these to launch. The formula has a hint of menthol so it leaves your lips with a mild tingling sensation and plumps them up. There's a special formula added to the lipsticks that stimulates collagen and smooths and plumps the contours of your lips. So along with that rich, creamy colour pay off you're also going to have plump juicy looking lips! 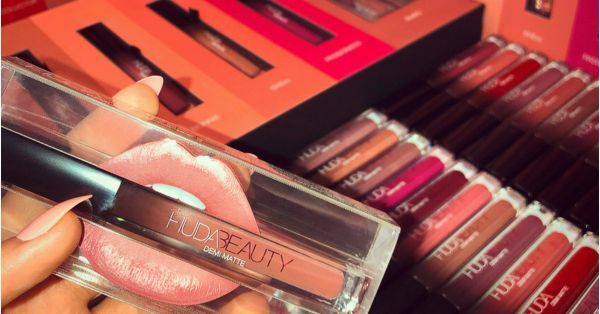 The collection will be available starting July 29, 2018 on Huda Beauty!